Announcement FireFlyFibreArts HAS MOVED! find me at my own .com! FireFlyFibreArts HAS MOVED! find me at my own .com! Beautiful rolags. Great customer service. Fast service on delivery. Pumpkin Chai Latte V2 has a light grey base colour. V1 is available with a creamy base colour. Both are equally beautiful and so hard to let go of. 2 beautiful sets. Rolags with wool locks. 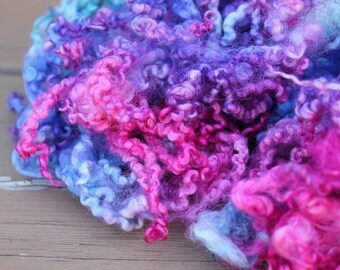 These will make some amazing art yarn. 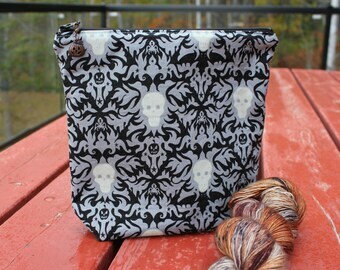 experimenting with different fabrics for my zippered bags. 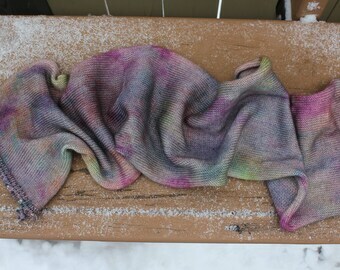 one of my favourite yarn I have dyed. More dyed locks. These are Teeswater. Only the best copper charms for my shop. We live by the lake (Lake Superior) so my inspiration reflects the nature all around me. Most of my items are one of a kind. Sometimes I attempt to duplicate an item, but being handmade theres always going to be slight variance. Because of this you can be assured that you are the only one to own it. I reduce, reuse, and recycle whenever possible, so your item may come in a plastic bag that I received fibre in, or my packaging can be reused by you. I am a tea drinker and love to sit down with a cup of tea when I settle in to knit or spin, so I send a bag or 2 of my favourite flavour along with every order. Email questions to: fireflyfibrearts [!at] gmail.com or send me a convo on Etsy. I have been crocheting for years and finally made the leap to knitting just a few years ago. It seems I have fell down the rabbit hole. Now I spin wool, process wool, dye wool, dye yarn, make batts, rolags and fun buns on my drum carder. Addicted! I welcome custom orders. It gives me a chance to step outside my comfort zone and try something new. Send me a convo on Etsy with the details and I can set up a custom listing for you. Custom listing must be paid before I start any work on the project. Custom listing orders are not refundable so I will try my best to ensure that you are happy with the finished product. If for any reason you are still not satisfied then a replacement item from my shop can be chosen. My goal is to have happy customers. Wool yarn and fibre should always be handled with care. I recommend hand washing in cool water with little or no agitation. Wool wash can be used according to package instructions. All of my fibres come to you already washed, clean and ready to spin or knit. Yes! I can deliver for $4cnd to my local in town customers or you can pick up from my house. We may be able to work out a meeting spot in town to do the exchange. Payment must be made through Etsy before we make arrangements and I will reimburse the shipping overages.